I am so excited about the newest piece of furniture in my house. It is exactly what I have wanted for ages, and now it is mine. It looks perfect, it will be fun to decorate each season and best of all this Providence Buffet Table/Media Console from Better Homes and Gardens for Walmart has storage! For the last ten years I have had a simple end table along this wall. It was the result of not being able to find something I loved and settling for what worked, only it really didn’t. It had a glass top set into the table, which made displays on top impossible because they had to sit on the small glass part. And it had a single shelf that really wasn’t deep enough for baskets. So it was simply decorative, and in my house I need storage. This is the old table. Like I said, fine but not what I wanted. Now I have a flat surface for decorating and storage, storage, storage!!! Not to mention this buffet looks great in the room. Here’s a the secret. It is pretty on top, but inside it is filled with kid things. For example, the drawers contain boxes of art supplies. And in the cubbies below, I was able to stow board games on the top shelves and the bottom shelves are tall enough for my favorite Better Homes and Gardens for Walmart wire baskets. The baskets are only $7.47 each. Currently, they are empty, but they won’t stay that way long. I think I might fill them with some of my craft supplies or maybe some of my husband’s extra cables. Either way, they are hidden inside this beautiful buffet table and unless you peak inside, no one is the wiser! Now that I have the perfect piece of furniture for this wall, I think it is time to do something with the wall. That mirror has also hung there for 10 years, and I am ready for something new. A gallery wall perhaps? Or maybe a tall mirror, either way this one is too high for the new table. What you can’t see in photos is how nice the quality of this piece is. It is very solid piece with smooth gliding drawers and easy opening doors with a magnetic close. It did require 100% assembly, but it fit together nicely. And although it isn’t 100% wood, you wouldn’t know at first glance. It really is a great piece! Although I will probably add family photos to the display, for now I made a cheerful printable to go in my new gold frame that I picked up a few weeks ago. I am obsessed with gold glitter lettering right now, so I thought it was perfect for this funky frame. 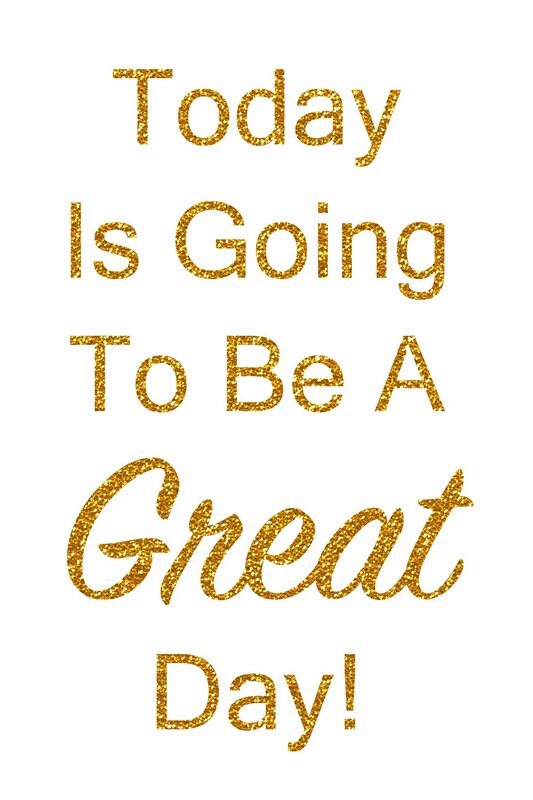 Download the Today Is Going To Be A Great Day printable. Did you know Walmart carried such nice furniture? The Better Homes and Gardens furniture you can find at Walmart is really impressive, and you can’t beat it for the price! This post was in partnership with BHG at Walmart. As always, all opinions are my own. Love the buffet! It looks perfect for all the games and toys!